When it comes to great songwriters, they don't come any greater than Randy Newman. Despite the fact that most people would be hard pressed to sing a song by Randy, we've all heard his songs. That's because, in between his albums full of brilliant songs, he's managed to write original songs for the movies to the tune of 17 Oscar nominations (finally winning a few years ago for "Meet The Parents"). What makes Randy so brilliant is his ability to write a song from a point of view other than his own.... often a point of view that you don't care to hear. Still, he does it so well that you are drawn to his songs because each one so clearly defines itself, each invoking a character all it's own. He's only had two real radio hits over the years. One was "I Love L.A. and the other was back in the 70's with "Short People." Many people criticized him for writing a song that condemned people because of their height (Short people got no reason to live...). All it takes is a quick listen to the bridge (Short people are just the same as you and I, all men are brothers until the day they die) to realize that the whole point of the song is to make it clear how silly it is to condemn anyone over physical appearance. 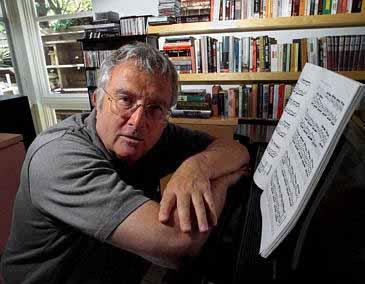 It's hard for me to pick a favorite Randy Newman song so I'll give you a couple. First, a great song about a big-time Hollywood type and his arrogance about his own life (My Life Is Good) and then, in honor of New Orleans, a song about his childhood in the Crescent City (Dixie Flyer).